Kshullaka Jinendra Varniji, one of the best known Jain scholars of 20th century, is known for his pioneering five volume "Jainendra Siddhanta Kosha" and Saman Suttam compilation, the first text accepted by all Jain orders after 1800 years. Pujya Shri Jinendra Prasad Varni ji was born at Panipat (Haryana), India, in 1922 and left his mortal coil peacefully at Shantinikentan in Isari at the foothills of Sammed Shikar Ji in 1983. From childhood, he was of very quiet nature, and religious in his attitude to life. In 1938 he lost one lung due to tuberculosis. Still he studied Electrical and Wireless engineering. Varniji got attracted towards Jain science at the age of 22 and started deep study of Jainism with his sound Jain family background. 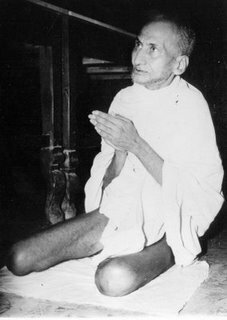 He left home in 1957 (age 35) and during his wanderings he joined well-known Kshullaka Ganesh Varni, who ordained him a chhullaka. Unable to follow the vratas of a kshullaka due to health problems, he returned to being just a brahmachari. Even with a fragile body and only a single functional lung, his contribution to Jain literature is exceptional. Shri Varni ji stayed in various cities during his life journey – Panipat (Haryana), Saharanpur (U.P. ), Muzaffar nagar, Nasirabad, Indore, Rohtak (Haryana), Varanasi (U.P. ), Bhopal, Chhindwara (M.P), Sagar (M.P. 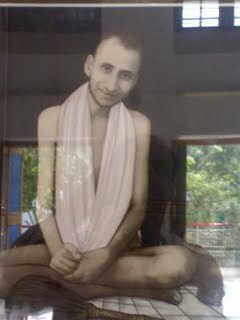 ), Ishri (Shanti Niketan) Sammed Shikhar Ji. Glossary of Jain terminology in 4 volumes. One can search the Jain philosophy topic (e.g. Nirjara) and find lots of quotes from various scriptures with the definition, index table, context, stanza/gatha reference etc. The compilation is quite comprehensive as it references Agam 651 Agam scriptures & 618 Acharya names. A compilation of canonical verses from all the Jain sects compiled at the inspiration of Shri Vinoba Bhave. Sometimes known as Jain Gita, it is a common work acceptable to all sects of Jainism. A tribute to the works of Acharya Kund Kund, the best known mystic of Jainism. The subtlety of how the Doctrine of Karma works. 7. Shanti Path Darshan Guidance to the path of peace: collection of his discourses given during his Chaumasa Varshaavasa the four month rainy season resort at Muzaffarnagar. It was first published in Hindi during 1960. In response to popular demand, it was translated into Gujarati by Shri Sunanda Bahen Vohora and published by Shrimad Rajchandra Adhyatmik Sadhana Kendra, Koba in 1986. Shanti Path Darshan is useful not only to a beginner taking first steps in Jainism, but also to a more experienced because of its simplicity of expression as well as clear explanation using good analogies. It first explains what is Dharma, and why it is necessary for one to follow Dharma, through the Jain doctrine of seven tattvas – the elements of absolute reality. The theory in first 10 chapters are explained as practice in rest of the book through the doctrines of 10 Yatidharmas or virtues, 6 Avashyakas or daily essentials for Jain laity, and other religious rules and rites.